Arriving later this month, Starbucks introduces two new flavors to their line of bottled Frappuccinos as well as new Doubleshot Coffee & Protein. The two new flavors of Frappuccinos are S'mores and Mocha Coconut. S'mores features the flavors of marshmallow, chocolate, and honey graham with coffee and milk, while Mocha Coconut combines the flavors of chocolate and sweet coconut with coffee and milk. Both flavors are available in 13.7-oz bottles. 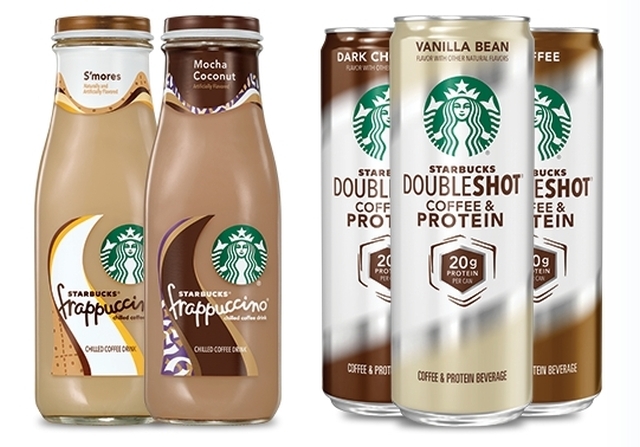 The new Doubleshot Coffee & Protein line introduces a protein-fortified version to Starbucks' lightly-sweetened espresso and cream canned drinks. The "coffee & protein" beverages contain milk protein concentrate to bring up the protein count to 20 grams per can. Starbucks Doubleshot Coffee & Protein drinks are available in 12-oz slim cans and are available in three flavors: Vanilla Bean, Dark Chocolate, and Coffee.